olving Africa’s hunger crisis, in which at least 38 million people in Sub-Saharan Africa are suffering exceptional food shortages, clearly will require a multitude of political, economic, and scientific efforts. One promising project—spearheaded by IUPAC’s CHEMRAWN Committee—is trying to boost sustainable agriculture in Africa through chemistry. The main focus of the project is organizing the CHEMRAWN XII Conference on Chemistry, Sustainable Agriculture, and Human Well Being in Sub-Saharan Africa, which will most likely be held in 2007. Although details of the conference are being worked out, a foundation of enthusiastic support has developed across the African continent since a preliminary workshop was held 7 August 2004 in Arusha, Tanzania. On behalf of the CHEMRAWN Committee, a one-day workshop was convened as part of the program of the International Chemistry Conference in Africa, which took place 2–7 August 2004 at the Arusha International Conference Center. The 34 participants who attended the workshop were drawn from 12 African countries as well as Sweden, the United Kingdom, the Netherlands, and Bangladesh. and implemented by each conference’s Future Action Committee (March-April 2003 CI, see p. 6 in print). The workshop galvanized “grassroots” support for CHEMRAWN XII by elucidating how the vast array of analytical and problem-solving tools of the chemical sciences can contribute to the quest for food security in sub-Saharan Africa. Participants were unanimous in welcoming the objectives of CHEMRAWN XII as comprehensive, insightful, and adequate for driving a productive dialogue on ways to promote sustainable agriculture with substantial contributions from chemistry and chemists. Participants also agreed that it would be more meaningful for CHEMRAWN XII to be held in a country where the problems to be discussed during the conference really exist in tangible forms, such as Ethiopia, Tanzania, Kenya, or Angola. Background to the Food Question—Using a hypothetical food problem tree, Ayoola identifies the root causes of the food problem in the region as (i) poverty, (ii) aberrant and conflicting policies by national and global bodies, and (iii) socio-economic discontinuities. 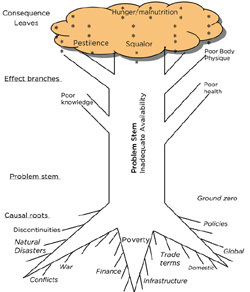 The stem of the hypothetical tree represents the main axis of the food problem which consists of (i) inadequate availability of food and (ii) lack of access to available food. The cumulative effects of these are the evident symptoms of the food problem, such as starvation, pestilence, and squalor. Some African Perspectives—According to Ayoola, some of the major causes of the grim food security situation are subsistence food production by resource- and infrastructure-poor farmers who are unable to adopt proven technologies; focus on exportable cash crops at the expense of sustainable farming; weak relationship between agriculture and industry; limited access to food due to poverty; and widespread incidence of HIV/AIDS, which limits the number of laborers available for agriculture. The Challenge of Scientific Agriculture—Ayoola states that the long-term objective of food security can only be attained by attacking the issues at the root of the problem, using the two main action pillars of technology advancement and market development, wherein the challenges of scientific agriculture can be located. He identifies a number of areas that hold promise for scientific agriculture: genetic engineering and bio-control, process technology and management (fertilizers, pesticides, etc. ), and product technology (post-harvest preservation, processing, storage, etc.). The IFDC Model—Ayoola argues that steady scientific intervention together with integration of markets or regional circumstances is superior to ad hoc food aid as a mode for addressing the food question. The paper is well researched and very informative. It not only forms a basis for discussion, but also will stimulate chemists to address issues of sustainable agriculture in sub Saharan African. The second half of the workshop was devoted to a free discussion among the participants on the following question: “In What Ways Can Chemistry Contribute to Food Security and Sustainable Agriculture?” Following is a summary of the contributions from participants. • provide examples of successful research in chemistry that are relevant to agriculture. According to Professor Bukuru of Burundi, there is a woeful lack of interface between governments in Africa and scientists, especially chemists, which means that decisions regarding the food problem are not informed by sound science. So even though there are many chemists in Africa engaged in research on various themes relating to the food problem, the results of their research are often not brought to the attention of the decision/policy makers. Therefore, Bukuru suggested, the various African chemical societies should collect all relevant research regarding sustainable agriculture and summarize and disseminate it to relevant authorities. In general, he stated, avenues should be explored to bring chemists and decision/policy makers together, to act cooperatively in matters relating to enhancing food production and availability. Dr. Keriko of Kenya provided a compelling example of how chemists can help develop sustainable agriculture. He discussed how the Jomo Kenyatta University is helping to rehabilitate the yellow oleander plant (Theveta peruviana), a drought resistant plant used for seed oil production in poor, dry areas of Kenya. The plant is traditionally used as a hedge, for the provision of shade and generally as an ornamental plant. According to Keriko, the plant has a hard seed whose inner kernel, which is 30% of the seed, contains 61% oil. Analysis of the oil reveals a fatty acid composition that is similar to the oil commonly used in the manufacture of soaps and detergents. Keriko said that the project is utilizing the oil in the manufacture of soap and cosmetics and is exploring its use as bio-diesel for diesel engines; as well as investigating its edibility. investigate how to use natural products as pesticides, fertilizers, and food preservatives. One way that chemistry can help address the food question in Africa, stated Professor Åkerblom of Sweden, is to encourage the use of what is available. In this regard, she said, food preservation is very important. The food chemist can engage in research on how to improve the nutritional value of the foods that are available. Simple methodologies that result from such research can then be disseminated. Participants commended the CHEMRAWN Committee for this laudable initiative. They urged that no efforts should be spared in organizing the conference because of its inherent potential as a platform for concerted action by chemists to help transform agriculture and increase food production and availability in sub-Saharan Africa. Ikenna Onyido <ikennaonyido@yahoo.com> is professor of chemistry and director of the Center for Agrochemical Technology at the University of Agriculture, in Makurdi, Nigeria. He is chairman of the CHEMRAWN XII project. Page last modified 20 April 2005.